Slice, Freeze, Grind and Serve!! Yes, its that simple and all you need just one ingredient. Sounds exciting? It was an exciting experience making it. I never thought making ice cream would be possible without an ice cream maker and even with an ice cream maker, I didn't think it would be this simple. 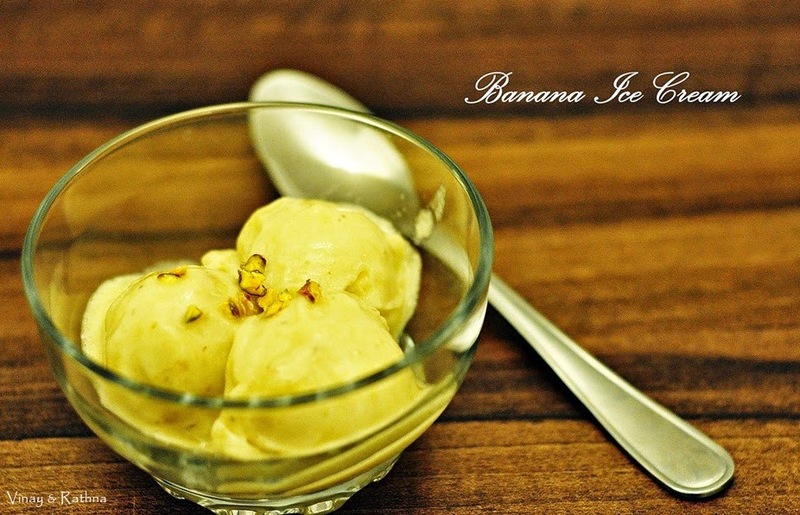 So, what makes this recipe awesome is that in an hour (or however long it takes you to freeze your banana) you can have smooth, delicious and healthy ice cream. Simply amazing and a must try recipe! Peel and slice the bananas into small round pieces. Arrange the banana pieces in a plate or tray with baking sheet to ensure the slices are separated from each other. Take the banana slices out from freezer and grind them . Serve the Ice cream immediately if you like your ice cream soft. Freeze the blended mixture in an airtight container until its solid and enjoy. This is the serving portion for one, so increase the number of bananas for for larger quantity. Freezing time may vary depending upon your fridge, so ensure your banana's are frozen before you grind them. Add sugar while grinding the frozen banana, if the banana isn't sweet enough. You can also add in Nutella or chocolate sauce or any syrup to give your ice cream another flavour dimension. Experiment it and let me know what your favourite flavours were. While serving you can add chopped nuts or chocolate sauce to spruce it up.